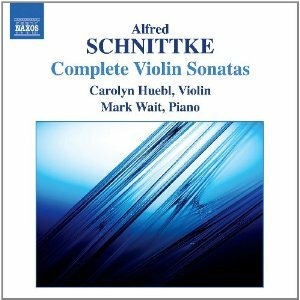 Like so much of the 20th century repertoire, the Schnittke Violin Sonatas are ideal for the Naxos approach. There are already a good number of recordings of these works (although the 1955 Sonata is a rarity), but the quality of what is on the market is variable, and until now none has been available at budget price. The fout Sonatas neatly précis Schnittke's career. The 1955 Sonata, usually called No.0 although not here, is a student work in an early 20th century social realist style. No.1 is more adventurous, mixing some serial technique into still relatively consonant but harmonically adventurous textures. No.2 was Schnittke's route into polystylism, and while it isn't as eclectic as the later polystylistic works that made his name, it is certainly in a similar spirit. And finally No.3, which is typical of his late style, with simpler textures, white note harmonies, and a transcendent quality that makes the reduced musical resources always seem sufficient. It is an open question whether Schnittke's music requires a Russian approach in performance. He doesn't rely on heavy, muscular bowing in the same that Shostakovich does. But he does expect a real sense of interpretive focus, not serious as such, but committed in every phrase. Carolyn Huebl and Mark Wait are audibly distant from Soviet Russian performance traditions, but that's no bad thing. There is as much commitment here as you could want, and the structuring and atmosphere in most of the movements is really convincing. But both players, and Huebl in particular, have a lighter approach to much of the music, almost dancing with the rhythms at times. This works to the greatest advantage of the 0 and First Sonata. The First in particular is given an energised and propulsive reading. It is a surprise listening to the first movement how rhythmically inventive the music is. The two players never make the music sound trivial, but they do make it sound natural in a way that few others achieve. The violin's intonation is spot on, which given some of the technical demands, like the passages of double stopping and artificial harmonics, is no mean feat. Sonata No.2 is less convincing. It isn't bad, not by any means, but this is music that really needs that guttural, physical (Russian?) approach to bowing and articulation. The interpretation is still impressively coherent, and Schnittke's graphic notation is convincingly rendered, but there isn't the shock factor that the music needs to make its impact. Perhaps the performers were taking the structural issues too seriously, the build-up to the final climax is excellent, but by saving it all up for the end, much of the preceding music just seems too casual. Sonata No.3 works better. Again, this is a thoughtful and carefully planned reading. Schnittke was never one to put more performance directions into his scores than he had to, often leaving the performers, not so much to interpret, as to decipher what he has in mind. And in this Third Sonata their decisions certainly convince. No.0, which is sensibly put at the end of the programme, also benefits from some imaginative interpretation. Quite significant dynamic and tempo changes are often added, but they all seem to make sense. As usual from Naxos, the sound is good but not of the highest quality. The recording was made in a concert hall, and the resonance suits the violin better than the piano, which has a curiously boxy sound. It's still worth hearing though, and it is great that these fine works have made it onto the Naxos catalogue. Sonata No.2 will always be the most famous for its heralding of Schnittke's polystylistic phase. But No.1 is a better work, and it is No.1 that comes over best in this recording. The performance of that piece alone is enough to recommend the CD.